I have absolutely no idea whether "sweating" is relevant verb thus I am including some photographs. I have got this problem with my oil varnish - after it is applied it creates sort of tears, drops, lakes. My varnishing process is following - I prepare the surface, apply gelatine, than thin ground coat of my oil varnish (colophony, turpentine, linseed oil, lime), after it is dry I apply thin coat of artists' oil paint (colourant) and after the paint is dry I apply another coats of my cooked varnish. And then the problem begins. What could be wrong? I understand that some ingredient is drying faster than the other but why would it happen when the artists' paint is completely dry (even for several years)? the only time I saw a similar effect was when my UV drying chamber got too hot! The most likely is that the varnish is not properly cooked so that the Linseed oil is not fully bonded with the resin. Second is an issue with the amount of oil in the pigment you are using. Try this: take a papertowel and squeeze out a ribbon of the pigment on to the towel. Let this sit for 24 hours in a warm place. Excess oil will leech out on to the towel. Thanks a lot. I tried oil pigments for the first time and didn't even THINK about that. 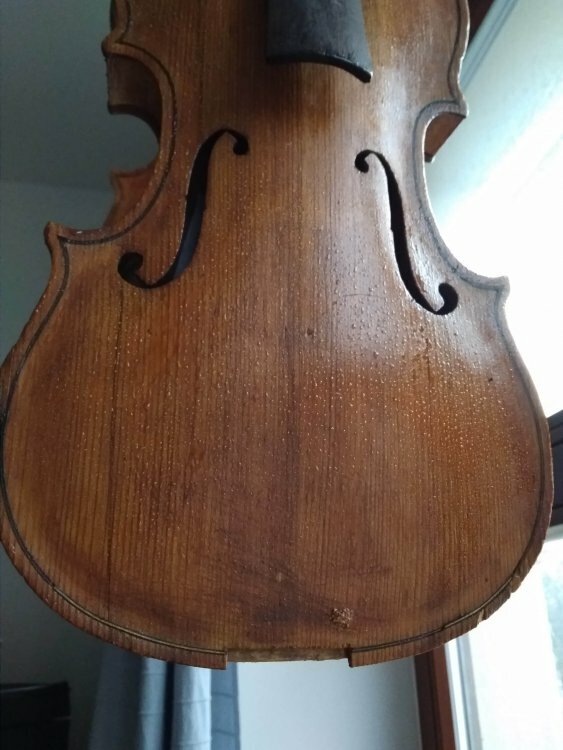 Is this varnish which is beaded up on the surface? If so, it looks like the surface has been contaminated with some kind of oil or silicone. What exactly is the "lime" you mention in your list ingredients? Cooked varnish can vary widely with temp and time and recipes, decisions on when to quit heat , .... What does it do without the color layer, have you tested that? I,ve had similar experience happen both from over thinning with solvent and applied to thick, as well as miss matched varnish, ....I suspect. Given that the belly appears to have dark cracks on the bass side, was this instrument stripped first, and if so, what did you use? When you were varnishing this, just how dry was the ground before proceeding? How long did the varnish coats take to dry, how many coats did you use? What did you use to dry the varnish? nothing, uv or driers? There are actually two violins in the photographs. The one with the crack was stripped years ago. I simply scraped down the old varnish (for training purposes) with scraper, then applied the colourant and then the oil varnish. First coat was great, varnish turned out to be very clear. After two or three weeks I applied second coat and then the sweating happened. To dry the varnish I used just the sunlight. The second violin, the one without the crack and the one made by me, was sealed using gelatine, then I applied thin layer of oil varnish, and then another coat of varnish mixed with artists' paint. Sweating happened. 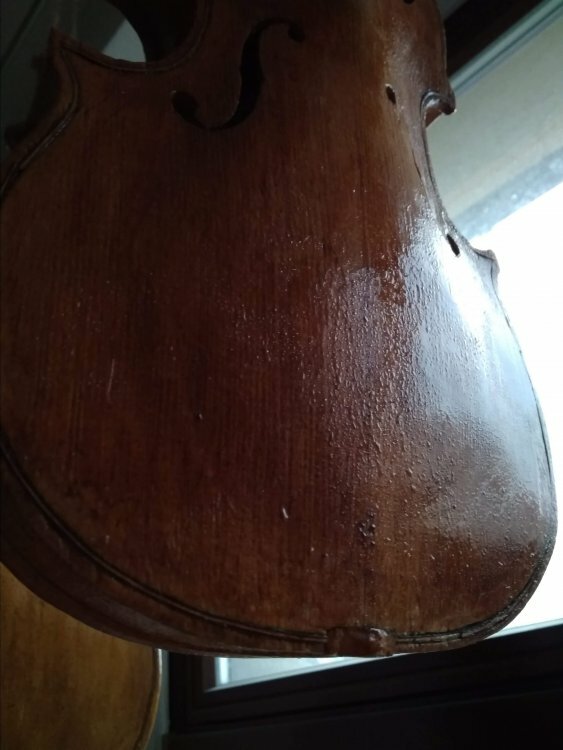 I have got another instrument - viola - that was also sealed, also had one thin layer of varnish, also had colourant and also had another coat of oil varnish and nothing happened. I am confused! Yes, I have tested that. It dries after some two weeks and then the varnish is perfectly clear. The lime I am refering to is calcium hydroxide to bring down the melting point of the colophonny. the gelatin is giving you a condition of "surface tension" is greater than "surface attraction", ie, that there is no adhesion of the proceeding oil coat to the gelatin coat, so it balls up. My guess. I do not think so. The violin with the crack has no gelatine sealer and the problem still appears. It looks similar to a problem I had with the varnish beading up terribly instead of wetting the surface underneath. There was a thread about it here. In my case, it was due to the thinner that I used in the varnish. I re-cooked the varnish to boil out the solvent, added a different thinner, and the problem was gone. In any case, it's a wetting problem... could be surface contamination, as David suggested. The term sweating is relevant. Something is seeping through upper layers to the surface. There is a term used by artists using linseed oil based paints, and that is "Fat over thin." This means first coats on a canvas should be thin, plenty of solvent (gum turpentine) used to dilute the oil paint so that it dries or polymerises completely before thicker, oil-rich layers are applied. The culprit is either the final cooked oil varnish or the applications beforehand, or even perhaps a combination of both. It might be a good idea to check that your cooked varnish cures properly. If you applied a thick layer of this varnish to a piece of wood without any other underlying coats and allowed it to cure completely you should be able to detect any oil seeping to the surface. If it passes the test you will then know that the problem is probably with what lies beneath. 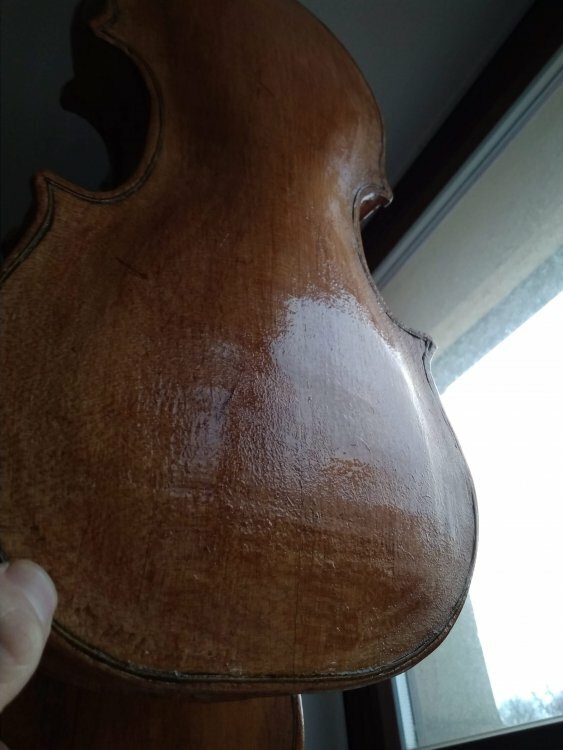 I know that luthiers use all sorts of grounds and sealers under varnish for various purposes, but I'm beginning to wonder If they are more trouble than they are worth. I tend to think that a coloured varnish over bare wood may be the best way to go. Dominik, it's still not clear what the pictures are showing. Is this a varnish which was applied, then formed this pattern and dried that way, or is it a liquid which has developed on the surface after the coating has dried? to cook the varnish I melt the colophony first. After all the colophony is melted I dissolve a bit of the lime in the water and slowly add it into the colophony. Once all the lime is mixed with it I add linseed oil and boil this mixture until I have decent string. After that I let the varnish to cool a bit and then I add a bit of turpentine to thin the varnish a little bit. The varnish showed in the pictutres is in the process of drying. The coats applied before were all right. Once I applied another coat the problem occured as soon as the varnish touched the instrument. I also thought it could be something with the thinner but I do not understand why it wouldn't occur when the first one or two coats are applied. Maybe the third + coat somehow reacts with the first two? I surely should do some testing on plain wood or to combine my techniques on some scrap samples to figure out what is wrong. I will definitely keep updating this topic. 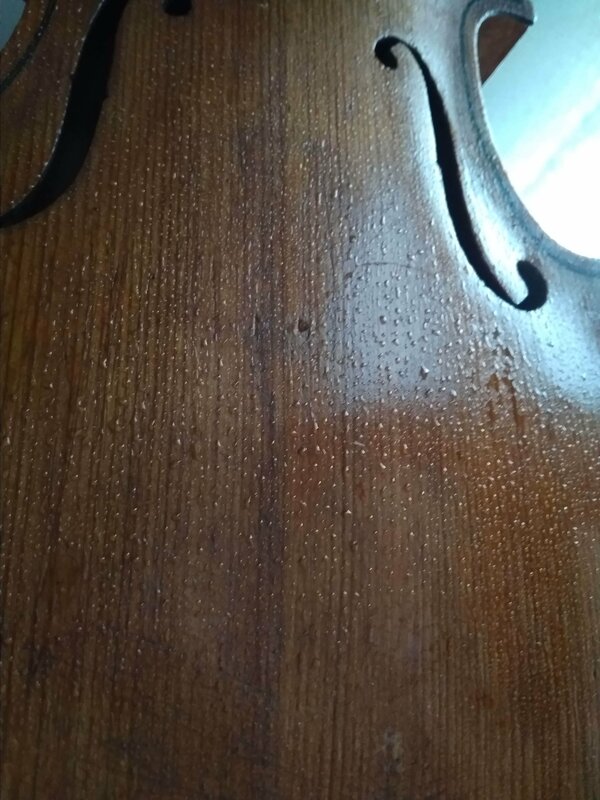 If the vanish forms this pattern as soon as it is applied (or shortly after), and then dries as if these raised areas are composed of dried varnish, then this would be a "wetting" or surface contamination issue, and not "sweating". It's like the way water beads up on a freshly waxed car. It could be something in a previously applied coat of varnish, including contaminants in the solvent. I'd say it's more likely that you are doing something different between coats where this doesn't happen, and coats where it does. It could be any number of things, deliberate or accidental. For example, I don't use aerosol sprays containing silicone anywhere in my workspace any more. I remember someone posting varnish experiment with undiclosed thinner that gave such bad beading with the second coat... Year or so ago... Who was it? Don Noon or Mike Molnar? Dominick, did you heat the oil before combining it with the colophony? Did you rub down the first coat with an abrasive before applying further coats? No I did not as this was my first time cooking varnish and the instructions did not say so. I followed steps mentioned in this video: https://www.youtube.com/watch?v=gmHf5FHkh-c&amp;t=18s . Yes I rubbed down the first coat on one of these instruments yet it was no help.